I wanted to share with you one of the terrible effects of having an eating disorder such as anorexia or bulimia. 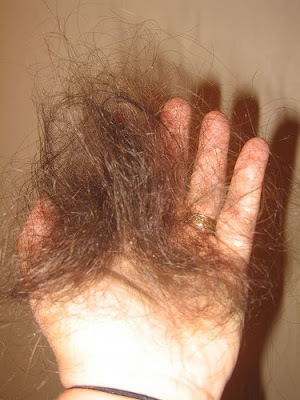 When you have an eating disorder such as this your hair will fall out, and let me tell you hair loss is one of the most sensitive areas for women! So let us cherish the bodies we have, take care of them, and be grateful for them because they are truly a blessing and a wonderful gift. 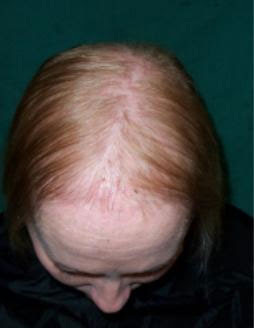 Below are pictures of two women who are experiencing hair loss due to eating disorders. For more information go to http://theimpulsiveact.livejournal.com/188740.html?thread=452676, these photos are sad, but what is sadder are how many girls and women out there who start these eating disorders to be "prettier" or to gain "control" over their lives, when in the end they end up losing both. Quick- No ties, bobby pins, or elastics!